We Offer Viaual and K-9 Bed Bug Inspections, We will identify the source of the BedBug Infestation and create a customized treatment plan to eliminate the pests. Let us be your BedBug Control Exterminator that you can rely on, Give Us A Call Today 1-844-305-8999. Typically, when a homeowner or occupant suspects a pest infestation they will call a pest control company and a technician will walk through the area and look for evidence of bugs. This works best for pests that are large enough to see and which move around openly. But bed bugs are notoriously difficult to find. Nocturnal, they come out of their deep hiding places at night because they are attracted to the carbon dioxide of our breath when we sleep. After feeding, they crawl back into their hiding places. The evidence they leave behind are their feces or blood smears from their bites. Once you notice their “evidence” you may already have a significant Bed Bug infestation. Dependable Exterminating offers bed bug control services in Brooklyn NY throughout Williamsburg Brooklyn NY, Brownsville, East Flatbush, Flatbush Brooklyn NY, Borough Park, Bensonhurst, Brighton Beach, Manhattan Beach, East New York, New York City, Westchester County NY, Orange County NY and Rockland County NY and the surrounding areas. There are two types of Bed Bug Inspections available. A physical inspection is performed by a human and a K-9 inspection ( Visual And K-9) is performed by a certified bed bug dog. Dependable Exterminating offers both physical and K-9 Bed Bug inspections. 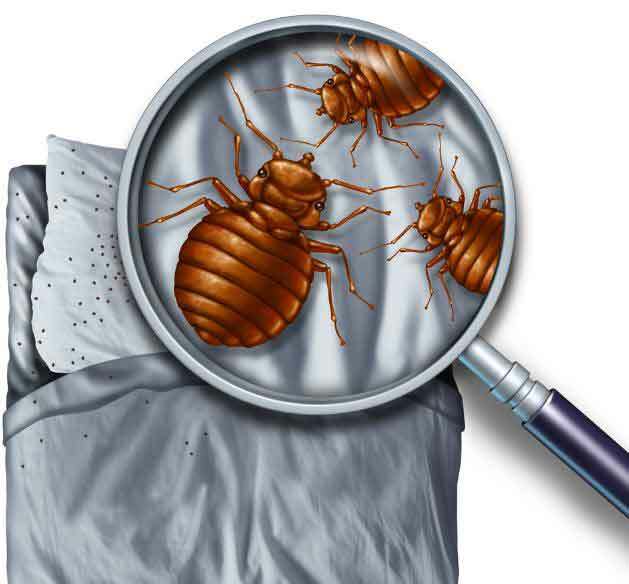 All physical inspections are performed by our certified pest control technicians that have the experience needed to identify the signs of a bed bug infestation. Dependable offers K-9 Bed Bug inspections through an independent certified contractor that is not affiliated with any pest control companies. Since they are not involved in the treatment process, they have nothing to gain by saying you have bed bugs or not. Upon completion of the inspection, you will receive an honest assessment of your bed bug status from their handler team. If the Bed Bug inspection is positive, we will provide you with a free estimate to eliminate the infestation. Our professional exterminators offer bed bug control in Brooklyn NY, throughout East New York, Manhattan Beach, Brighton Beach, Bensonhurst, Borough Park, Flat Bush, East Flatbush, Brownsville, Williamsburg, New York City NY, Westchester County NY and Rockland County NY and the surrounding areas. One call is all you need to begin the Bedbug Inspection process and we will do the rest! • Humans are credited with the ability to find about 30% of bed bug infestations as compared to 90-98% by highly trained and certified dogs. 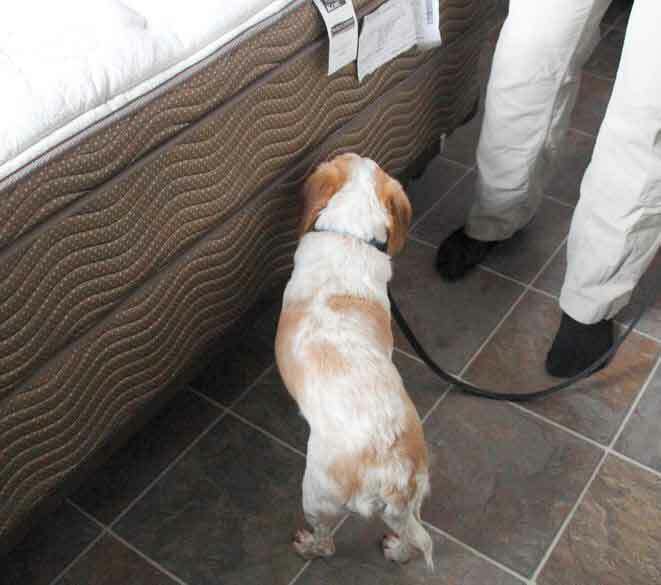 • Bed Bug dogs are highly trained and specialized scent detectors. These dogs are trained to find “live” bugs – not the dead casings of past infestations – and pin point where the infestation is. • Dogs can find bed bugs without disturbing and scattering them from their hiding places, making them easier to exterminate. • Dogs can find bed bugs even when they are burrowed deep under carpets, household items, and behind walls. • Physical inspections are less costly than K-9 bedbug inspections. Based upon your needs, we can customize an inspection schedule for your property on a yearly, quarterly, or even monthly basis. Pro-active bed bug inspections can provide an accurate “snapshot” of bed bug activity in each area. As the world becomes more educated about bed bugs, people will soon be on the lookout for places that are taking steps to ensure they are bed bug free. With regularly scheduled Bed Bug Inspections, we can provide you with the documentation which will demonstrate you have made a concerted effort to keep your property free of bed bugs. This type of pro-active stance can help establish loyal customers and may assist in limiting your liability in case of a lawsuit. Once you have contacted us and scheduled an inspection for Brooklyn bed bug control, our independent Bed Bug Inspections K-9 team will search your building/property to determine which rooms/areas are possibly infested. This information will be utilized by our technicians by allowing them to target these specific areas. Depending on the treatment method used, our independent Bedbug Inspection K-9 team would be able to perform a follow-up Bed Bug inspection the day after a heat treatment or 30 days after a chemical treatment. This inspection will help determine if the Bed Bugs have been eliminated or not.